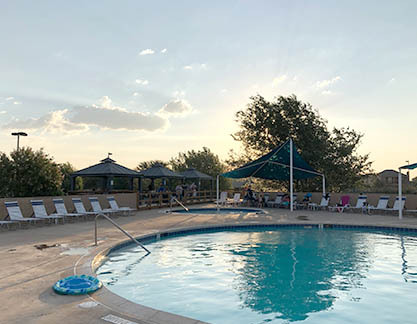 Rent one of the 3 private cabanas at our Lubbock health club and feel like a VIP! Each includes its own furniture and room to stash all of your pool gear. The cost is $75.00 per hour and you must reserve 3 hours in advanced (payable in advance/or charge to your member account with current or updated payment information; limited to one family per rental). Enjoy the pool area and stay out of the sun! Contact the member services desk at 806-687-6080 for availability or to make a reservation. The only outside food and drink allowed is cake and punch for Birthday parties. For catering options contact Bash Riprock’s at the pool grille for available party tray menu options, or email Mike for inquiries. Catering options: Contact Bash Riprock’s at the pool grille for available party tray options, or email mikefuqua@hotmail.com for inquiries. *Private Pool Parties: Will be unavailable for booking on Mondays (closed), and on Thursday nights due to Family Pool Nights. To book a party please call our parties department at (806) 855-3333! Full payment is due upon signing a rental agreement; and must be paid in advance to insure your reservation. Payment may be made through your membership account; but, only if you have current or updated payment information on file. Not available to non-members. Use of appliances in the kitchen area is not allowed. Members and non-member guests must follow all guidelines and rules of The Falls. All non-member guests must sign The Falls Guest Waiver upon entering the club. During rental, non-member guests have access only to the outside pool area and locker rooms/rest rooms. It is the responsibility of the renter to set-up, clean up and dispose of all trash after the party. Trash bags and cans will be provided. A full refund will be given provided we receive at least ten (10) days notice to cancel the reservation. Canceling within 10 days of the party will result in a full refund, less 20% of the total party price. A refund or another pool rental date will be given if the cancellation is due to bad weather. No Smoking and no pets are allowed in and around the pool area. Outside alcohol IS NOT allowed. Questions? Call the Member Services Desk at 806-687-6080. Rent one of the 3 private cabanas at our Lubbock health club and feel like a VIP! Each includes its own furniture and room to stash all of your pool gear. The cost is $75.00 per hour and you must reserve 3 hours in advanced (payable in advance/or charge to your member account with current or updated payment information; limited to one family per rental). Enjoy the pool area and stay out of the sun! Contact the member services desk at 806-687-6080 for availability or to make a reservation.